Southwest Indian Employment Program As you look through your mail we hope you find sandwiched between your bills and solicitations our stunning catalog of Indian jewelry as well as arts and crafts from the Southwest Indian Foundation. 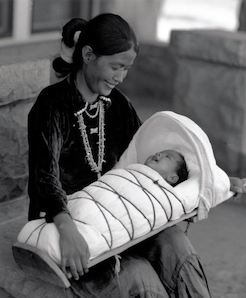 The Southwest Indian Foundation has been working to relieve the tremendous poverty and despair of these forgotten Americans Indians for over 25 years. 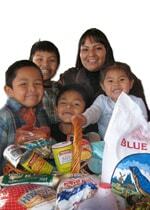 The Southwest Indian Foundation supports mission schools and homes for battered women and children, sponsors alcohol counseling centers, delivers food baskets every Christmas as well as clothing and shoes throughout the year and repairs homes and installs wood stoves. The Southwest Indian Foundation is actually spending its money as wisely as possible with your help. This is not an easy proposition with the current economical environment. The Southwest Indian Foundation markets products that help to support and help low-income artisans. Your purchases of crafts do help the poor. Although the Southwest Indian Foundation does not have a congregation that regularly meets for prayer services it has obtained church type status with the IRS under a group ruling of the U.S. Catholic Conference. This status allows the Southwest Indian Foundation to be exempt from state and federal laws that require charities to regularly file financial information with the government. Churches involved in trade or business activities unrelated to their exempt or charitable purpose do file annual information with the IRS on the for-profit portion of the organization but these filings are not open to public inspection. What is important to know is that The Southwest Indian Foundation posts its Annual Report each year for all to see. The Southwest Indian Foundation's primary activity, other than fundraising, is buying and re-selling jewelry and craft items. The Southwest Indian Foundation also provides support of mission schools and other human and social service programs. Deacon Daniel Nez Martin states that the Southwest Indian Foundation Catalog is a catalog of uniquely crafted gifts from some of the poorest people in the United States-the Indian peoples of the American Southwest. This catalog helps provide jobs because it serves as an outlet for my people to sell their precious crafted goods. Many of these poor artisans often have to borrow the money to purchase the silver, gold, turquoise and other expensive materials they use to make their fine crafts displayed in our catalog. Some commercial suppliers will loan materials to artists in hopes of receiving a percentage of the future sales. Although The Southwest Indian Foundation does not teach or train the poor or unemployed Native Americans to make crafts we provide the means. One to two dozen participants in The Southwest Indian Foundation alcohol counseling program have been trained to make ceramics. Many hundreds of Native Americans make products for our catalog and lots of them would not otherwise have jobs. It creates a ripple effect in an improved local economy, more jobs at the post office, positive effects on an artist's family and helps preserve the Indian culture for future generations. They also get the opportunity for millions of people to see their work, thereby helping them promote the crafts they create. Many of our Native American art items are unique. Many can only be found in our catalog. The cost of buying, selling and promoting the crafts in our catalog as well as printing and postage is very expensive. We have found it to be a very effective way to reach out to many, many, helpful and generous people with big hearts who are willing to help.5 out of 12 on our board are First Nation Native Americans, including 2 Navajo Judges. The Southwest Indian Foundation thanks you from the bottom of our hearts for all your help with our people.